A high adventure blog run by Evan and Derek, two twenty-somethings looking to get more out of life than indoor living. Climbing, camping, kayaking, hiking, who knows what we'll get into? Not us, but it's guaranteed to be awesome. It is such a shame that the year where I had plenty of trips I could have written about, I apparently forgot how to use a keyboard. (For anyone interested, I plan to post the Cliffnotes for 2018 at the bottom of this post.) Actually I started countless posts, and just never finished them. What a perfect way I could view the whole year of 2018. The year started with me blowing through my climbing goals for the year before the end of March. I also began tearing through additional goals I set for myself and my Kayaking goals for the year. 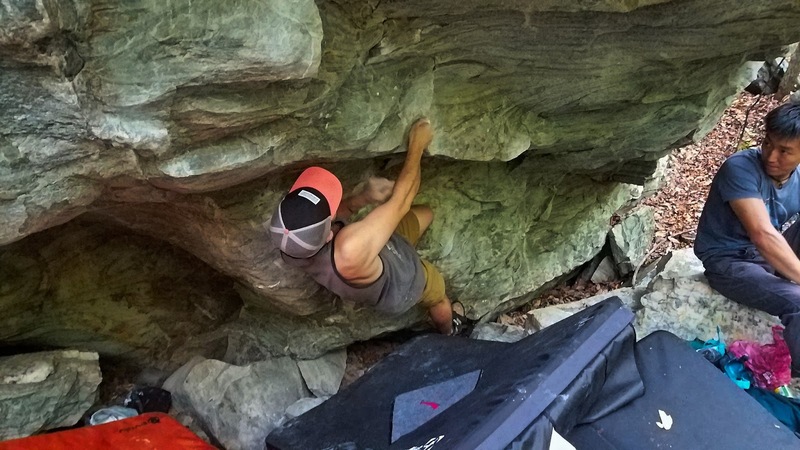 Unfortunately, as my paddling season came to an end, and I began to rededicate my time to get in shape for climbing, I partially tore my right Achilles. It took some time to piece together how it actually happened, but as anyone who knows me I have injured my right ankle multiple times over the past few years, and after multiple rather large ground falls (missing my crash pad) throughout the year I think my ankle just started to become weak. In retrospect I can remember a few times when I would be heel hooking on my right heel, and it would be excruciatingly painful. But, funnily enough, I didn’t actually tear it climbing! On October 14th, I met a friend, Nick, at Wilson Creek for a couple laps at +6”. After our two laps, we were walking back to the car on the stairs that lead up from the riverbed, and with my 50lb kayak on my right shoulder I stepped on an uneven step and immediately thought I had messed my ankle up, but I could still walk just fine. My heel just felt bruised, like it had almost a year prior when I fell 18ft off of a boulder. Two days later at work I realized I was having trouble walking, and slowly began limping throughout the day. That Wednesday when I woke up, I couldn’t walk; I couldn’t weight my foot at all. Thus began a long, and ongoing recovery process. I spent the next two months in a walking boot, and roughly an additional two months in Physical Therapy. I still plan to schedule one more Physical Therapy session, but for the most part my tendon is healing nicely and my calf muscles are re-strengthening. There is still some residual scarring on the tendon, that is uncomfortable when pressure is applied, but other than that it feels pretty much back to normal, though maybe a little weaker. I on the other hand have gained some weight and gotten weaker during this process, so I plan on working hard over the next month or so to try to get back into shape before I miss the entire climbing season for the year! My resolution for 2019 is to get back into my climbing and kayaking shape, and hopefully take a step forward, but with my main focus on staying healthy. Rewind to November 19th, 2017. 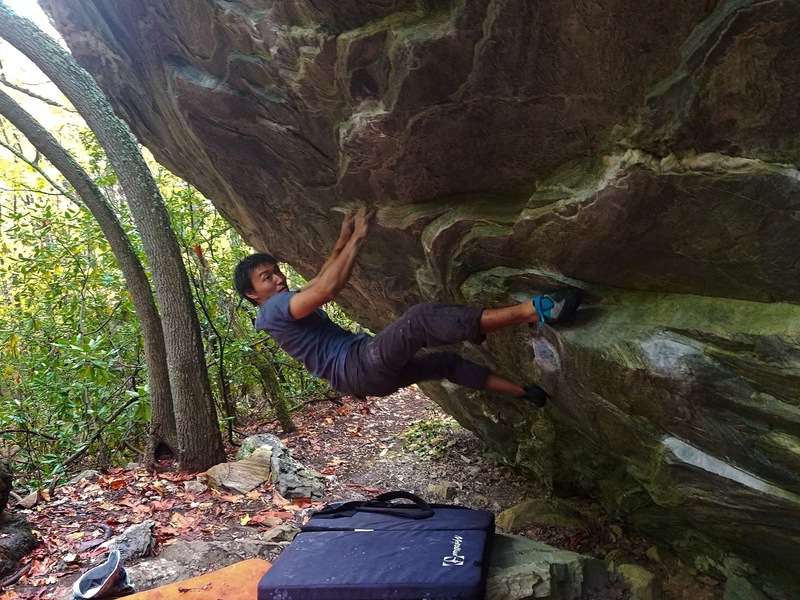 I sat in a hammock on Pilot Mountain watching Hiroshi working the moves on a project he’d started years ago, but had never come back to finish: Any Major Dude. I had spent the previous few months trying to get back into my peak climbing form after spending five months away from the sport. I was struggling. Struggling on climbs I previously wouldn’t have had problems with, struggling to find motivation, struggling to decide if I still enjoyed climbing. After Hiroshi was back on solid ground, he, Justin, and Keisei urged me to get out of the hammock and to tie in. To hop on Any Major Dude and give it a try on Top Rope. I tried to explain that it was pointless, that I wouldn’t be able to get anywhere, but the two were relentless. So I gave in and hopped on the wall. Thanks to their support, and some advice on beta- I eventually managed to hangdog my way to the top of the wall. It was definitely hard, but it did not feel impossible. After watching Hiroshi redpoint climb, I had motivation to try again. So I hopped on it one more time. This time, remembering the beta I managed to get through the climb, only falling once where I had forgotten the location of a key handhold that is hard to find. I decided to not try again, because I wanted to come back and lead it from the bottom when I was fresh. On the entire hike out I could feel the excitement I felt on Any Major D revitalizing my sense of enjoyment in climbing. I had found my motivation. The months that followed we had conversations where we questioned whether we had ever really pushed ourselves and our climbing, after watching the short film Stumped, part of Reel Rock 12. (At least when it came to sport climbing.) 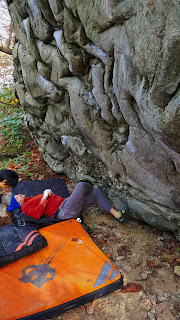 We talked about when we used to set at UNCG’s rock wall and the grade cap the wall had seen because none of the setters had ever really been on a 5.12 - so the notion that any of us could set a 5.12 was somewhat silly. We started talking about what we wanted to do with our climbing. 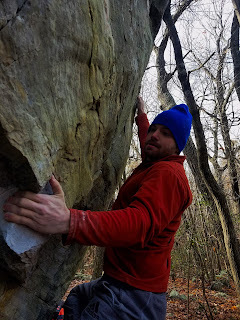 I didn’t really get the chance to climb with them during this time, but managed to send my first couple V5s, and when January rolled around I pulled back on Any Major Dude, once on Top Rope to relearn the sequence, then once on lead - to claim the redpoint. Stoke was high when I got down, remembering how only a few months ago I was dealing with an internal struggle over whether or not I still enjoyed climbing. I looked up at the line on the side of Pilot Mountain, realizing it had saved my hobby. The view from the summit on the hike out. To keep the story short, and to not rehash my previous post here, Keisei invited me to head out to Crowders this past weekend. The weather forecast wasn’t ideal, but we were both hopeful. He wanted to get a few routes in before his Single Pitch Instructor course next weekend, and I think he knew I was itching to hop back on Welcome to Crowders, the unfinished business I had from the weekend before. After warming up, we made our way to the base of the climb. I was confident, and was ready to start making way up the climb. There was one move in particular I told Keisei to watch out for. As I pulled my body up to the second bolt, I place my left foot on a somewhat existent foot placement, while I hold my body weight close to the wall with a thing left hand undercling. Once my right foot moves to its high placement, the clipping position is solid, but just as my right foot crept its way into position, the left foot popped unexpectedly and I was off the wall. I took a short break, to calm my nerves and regain my strength. Even though I hadn’t gotten very high, the route is pretty consistent from start to finish and wanted to make sure I had the energy to make it to the anchors. 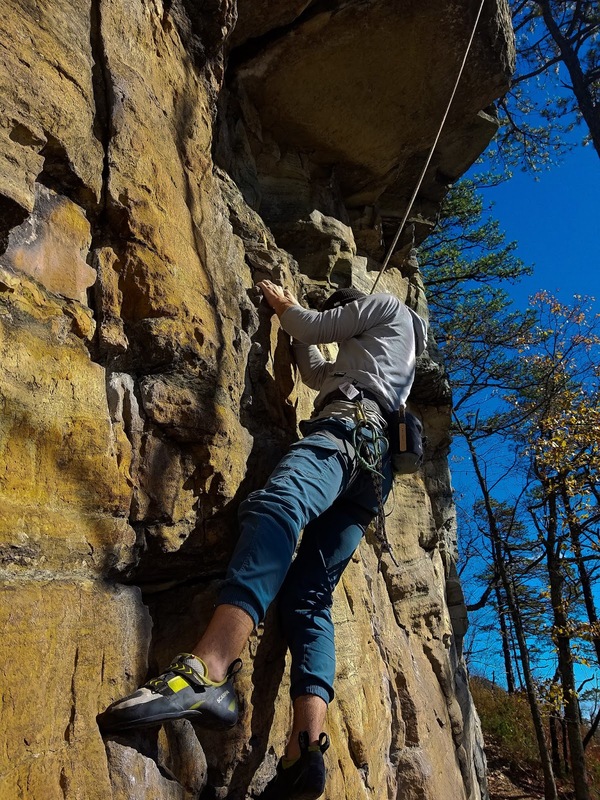 I pulled onto the wall, and stood on the bottom foot holds to get a good breathing cadence going until I could feel I was ready to climb. I made it back to the point I had fallen on the previous attempt, and managed to get the right foot into place. For the rest of the climb I struggled to do pretty much anything the way I wanted to. I placed my quickdraws on the bolts facing the wrong way, fumbled one of the clips, changed my clipping stance at the third bolt, and made huge changes to my foot beta for getting above the third clip. But I continued to push onward, until my hand reached the hold I knew meant easy climbing to the anchors. I wanted to yell out in excitement, but knew there was still climbing left to be done. And by the time I clipped the last quickdraw, the notion that I had just redpointed my first 5.12 had already set in- so I remained quiet. Only asking to sit at the top of the climb for a minute to turn around and look at the view. 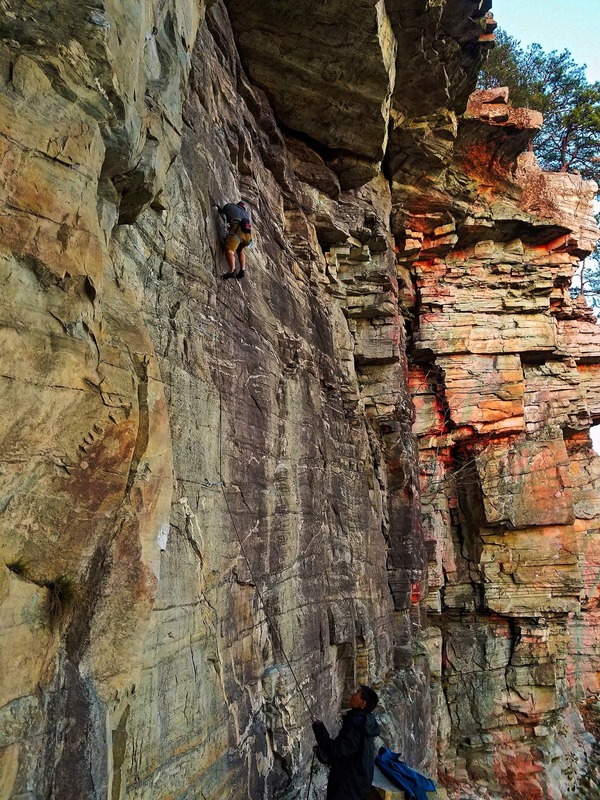 Climbing Welcome to Crowders is probably one of the most important milestones I’ve had in my climbing career. 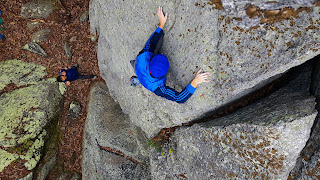 It is the route where I took my first real fall on lead (and my second), it made me remember the fun of pulling onto something that I know will test my limits, and it let me push into and experience a grade I wasn’t sure I’d ever actually experience. A lot of climbers helped me along the way to this point, and if any of them read this (whether they know they fall into this category or not) I hope they know how thankful I am. Unfortunately, I need to set new goals for 2018, because it would be pretty lame if the one goal I had for myself, for the year, was knocked out by March. So it’s time to start brainstorming where to go next. 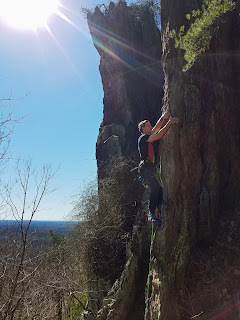 Today I got the chance to head over to Crowders Mountain with Mike and Andy to do some climbing. When I first started trying to set up the trip, I had two goals in mind: Sample more of the climbs at Crowders, and hopping on a 5.12 and try to figure out the moves, so I could start working it. I had only been to Crowders once, and hadn’t really been on too much and Mike and Andy had only done ropes outside once before, at Pilot. We were gifted with amazing weather! Without a cloud in the sky, it wasn’t too hot, but was warm enough when you stood in the sun. I also wanted to try to get Mike on his first lead climb, and to let Andy get more comfortable leading, and lead belaying. The hike it was just as tedious as I remembered, but the climbing was great. We managed to hit up a good number of routes, that we’d never seen before- and I think we all walked away having felt like it was a productive day. Before he was able to psych himself out too much, we got Mike onto Razor’s Edge. He crushed his first lead climb. Although he said he was sketched out on the way up, his climbing was certainly controlled and precise. After Mike got down I hopped on the route to see how it was. Halfway up I was reminded out some of the rock at Crowders felt hollow, but was surprising strong. It was the right route to start on, and let all of us get a good warm up in. Next Andy got on the route and made quick work of it, getting his first chance to clean a route. Mike on his first lead climb. 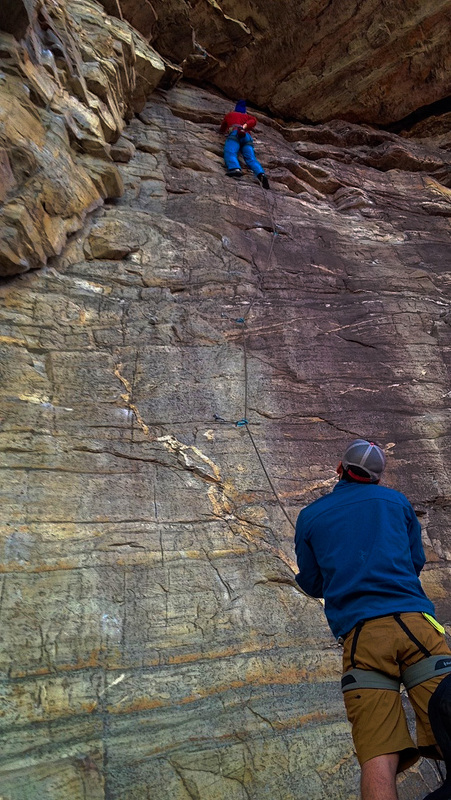 Even though this route is only 30ft tall, it lived up to its name. I lead it first to see how it would go, and to hopefully set up a Top Rope for the other guys to give it a go. Getting to the first clip is simple and you have an amazing rest before getting into the meat of the climb. From there you are on sharp crimps for most of the route, with one amazing sidepull to rest on before the crux. 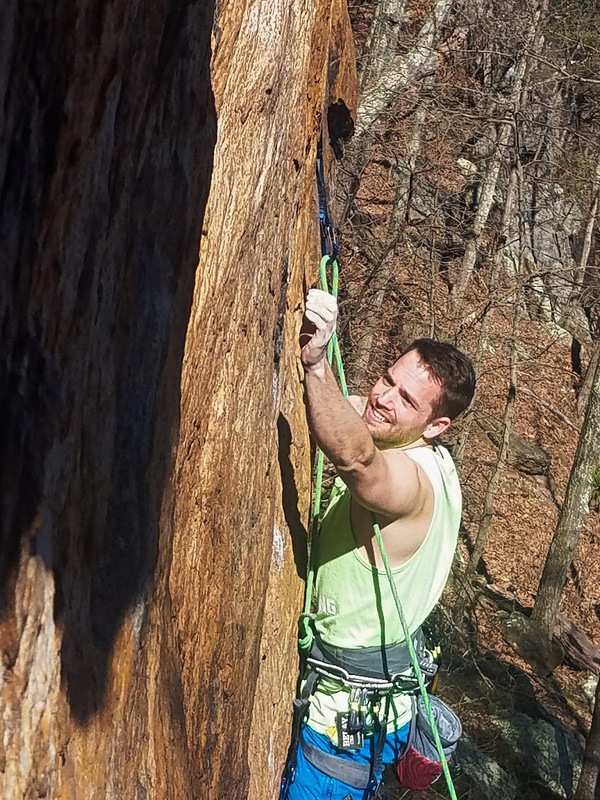 I had to think to make it through the top section, but felt happy when I clipped the anchor - easily the hardest Onsight of my climbing career. Andy hopped on the route next, and managed to work it well. He struggled a little down low, getting off the amazing ledge you clip the first bolt from, but only had to hang twice - which is great for your first time pulling 5.11 moves outside. Mike was the last to climb, and despite holding onto some of those razor crimps longer than I would have personally wanted to, managed to get his first outside Flash of a 5.11 climb! 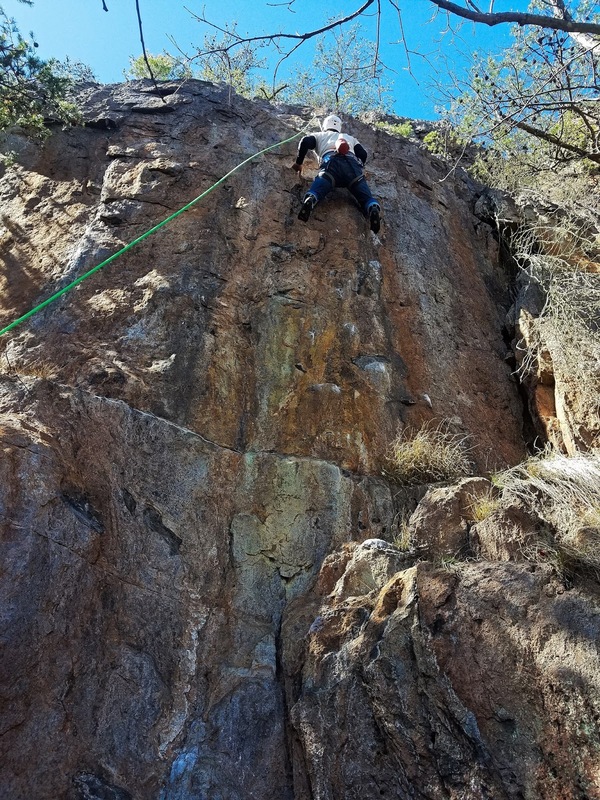 He then got to clean his first route. Andy getting up close and personal with the sharp crimps near the top. The reason I wanted to go to Crowders was the Red Wall had a decent number of 5.12a’s for me to look at and choose from. I had heard good things about Welcome to Crowders, and thought I could see the line the best from the bottom, so I decided to tie in and give it a go. I considered taking a bail biner with me, in case I couldn’t reach the top - but decided I would just take rests at the bolts if I needed to and try to work out the sequences. 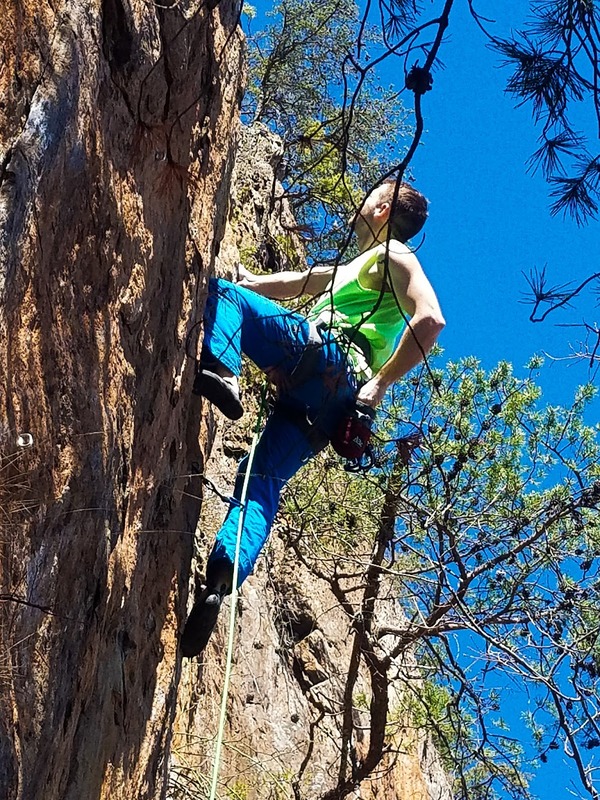 The route stays fairly consistent after the first few moves while it gains 35 vertical feet while traversing a decent way, making the climb probably closer to 45 feet in length. To clip the second bolt, I had to get high up with most of my weight on a tiny left foot and a left hand sidepull that is not ideal. That clip required me to keep my core tight and really keep pressure on the left side so I wouldn’t barn door off. After that there are a couple of big moves to a large flat sidepull with more miniscule feet to work with. From what I could tell the crux sequence starts just below the second bolt to just above the third bolt. So, I felt pretty good when I clipped the third bolt. I tried to rest some by underclinging the bottom of the sidepull, which seemed to work, while I tried to figure out the next few moves. This is where I personally got stumped. My body really wanted something to heelhook, but I was struggling to find a usable hold to lock my heel onto. Eventually I moved my hands a little higher without really figuring out the foot sequence- wanting to give it an honest go- hoping to get lucky and find something. I didn’t and hand to lower my body back to the third draw and call out, “Take.” I immediately found a crimp and decided to try to heel hook it. From there I managed to cruise to the top of the route. I learned that I was probably 2-3 moves away from the victory jugs that led to the chains. Keeping the core tight while clipping the third bolt. Trying to figure out the foot sequence for the last couple hard moves. I was exhausted when I got back to the ground, so we decided to move on and find something we could all do. That led us to the slabby climb, Holy Guacamole on the Trundlesaurus Wall tucked away on a small corner, on the edge of the mountain. Easily one of the coolest places I have ever gotten to climb. All three of us managed to lead our way to the top, and both Andy and Mike got their first 5.8s on lead. The view from the Trundlesaurus Wall. The sun was hiding behind the mountain by the time we got back to the climb, so it took a little bit of time for me to warm up, but before too long I was on the wall, moving quickly through the bottom sequence now that I knew the beta. 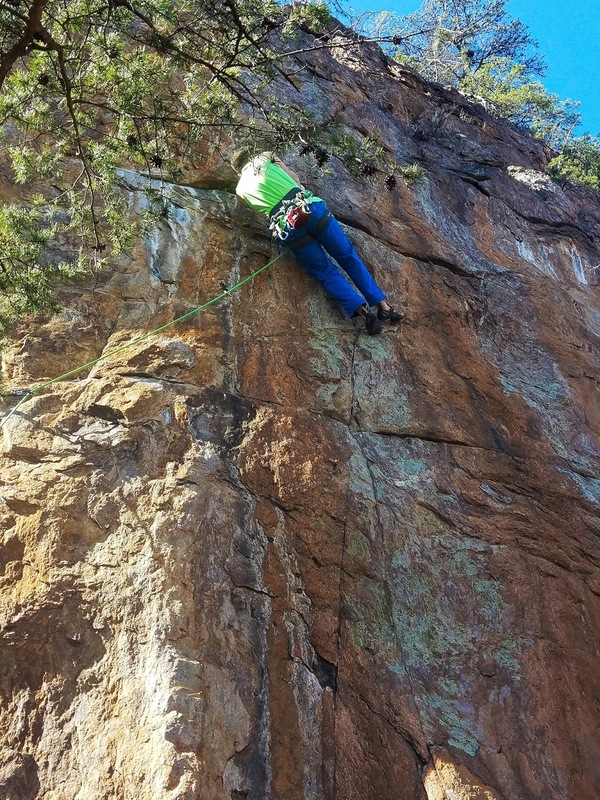 I felt strong as I pulled into the sidepull above the second bolt, and I was moving my right foot into position to clip said bolt when I felt my left foot pop off the wall. It’s weird, I had never taken a whip (large fall from above your last quick draw) while climbing outside, and had been dreading the day it finally happened. But as I fell the 10-15 feet back towards the ground the fear of decking against the ground and getting hurt never occurred to me. I remember thinking, “No!!!! I was feeling super strong there too!! !” Special shout out to Andy for catching his first whip, and managing to make it feel soft too. Back to the ground. The third time I was on it, I moved with more attention placed on my feet, especially as I neared the second bolt. Probably to the point that I was overgripping to some of the crimps as I went. I managed to grab the large sidepull from underneath at full extension, but then I realized I was stuck. 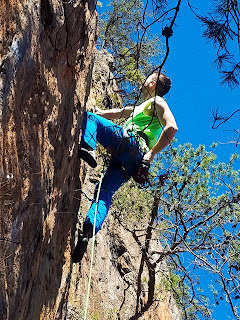 I’m still not sure if my feet were just slightly out of position, I hadn’t recovered enough energy after the second attempt, or if the thought of taking another whip and overgripping is what halted my progress, but I sat there unable to flip my hand around the sidepull to get it at the right angle. 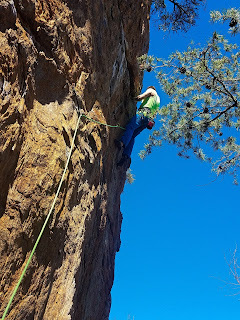 I ended up letting go and resting a little before climbing on, and reaching the anchors for the second time. As we made our hike out, it was easy to feel a little disappointed to have made it so close to sending my first 5.12- and not making it. 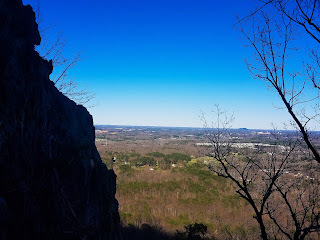 But if I really think about what my goals were as I hiked up to the crag, it is easier to remain positive. I not only got chance to hop on four new climbs today, sharing the experience with friends, but I also managed to Onsight a 5.11b (which is actually my first outside Onsight for ropes, now that I think about it), higher than my previous record of Flashing a 5.10c.I also got on a 5.12 for the first time, and not only did I manage to reach the anchors twice while hanging only once per attempt, but I managed to make it high enough to be only 2 hard moves away from Flashing a 5.12! Personally, I try not to put too much pressure on Flashes or Onsights, but knowing that I was close to doing so made me realize that having my goal for 2018 being climb a 5.12, I may have set the bar a little low. Welcome to Crowders may not go on the next attempt, or even the next trip- but I feel close to sending it. It is most certainly within my ability to do so. Now I just need try to remember my foot beta through the crux sequence, and potentially try to find a more neutral position for the second clip. Are These Annual Updates Now? It’s been over 8 months since Evan or I posted. Which is a shame because I know both of us have been up to some fun stuff. I am going to try to give a brief summary of some of the things I have been doing recently. Last April I got pretty sick for a couple weeks, right around graduation, and my level of fitness plummeted. This ended up resulting in me not really climbing from then until late August, early September. And despite me labelling 2017 as “The Year of Paddling” in my mind at the start of the year, I only got in my boat a handful of times. Which is unfortunate! And while it has been too cold for me to hop on the water, despite the amazing flow, I have been climbing a lot recently. Note to self: Buy a Drysuit this year so you can finally paddle year round. 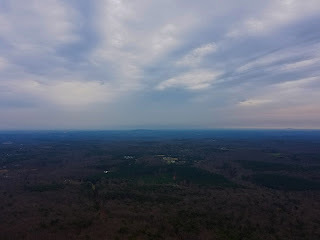 I have more to talk about than I will be able to cover in this post, like entering the Spartan Summit (UNCG’s climbing competition), my last couple days of route setting for UNCG, and a few videos of kayaking with Alec from last year. 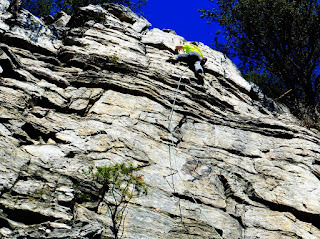 But for this post I am going to focus on my outdoor climbing trips. This was my first trip out on real rocks since April. Went out with Keisei, Hiroshi, and Mike (who was climbing outside for the first time.) I didn’t really climb anything new, but repeated a few problems. About halfway through the day it started to rain, so we took shelter underneath Stickman, and later Tsunami. 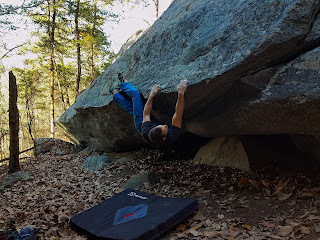 I had never tried to pull onto a V5, so it was interesting. It definitely felt doable, but I didn’t want to spend the whole day trying the same thing over and over. So we moved on to Tsunami so Keisei could hop on. 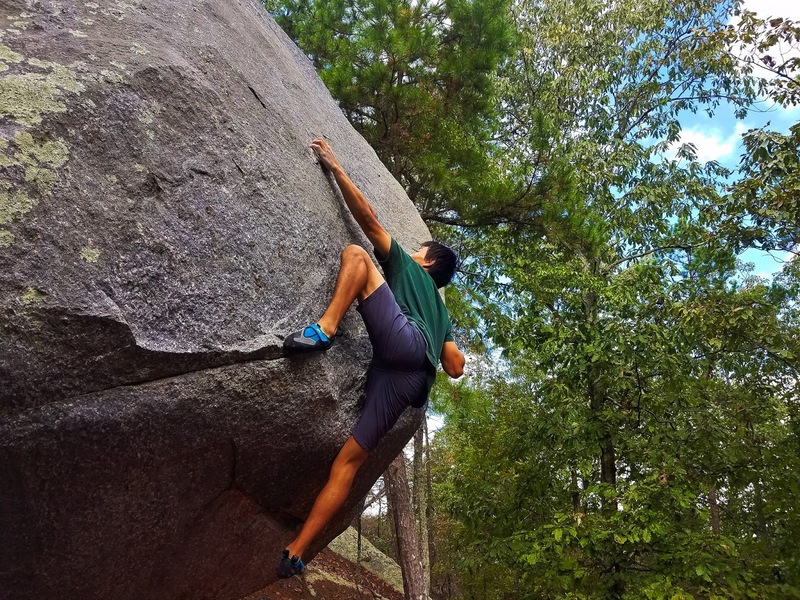 Mike's first outdoor boulder? 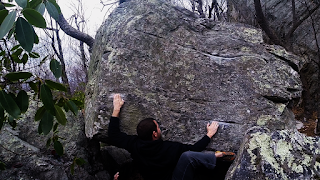 By The Beard of Zeus, a sketchy, surprisingly stout, tall V0. You're welcome! Keisei, Mike, and I went to Dixon to try to scout the area out and sample some of the climbs. Dixon proved to be an interesting place. I had always heard people complain about the sharp rock at Moore’s, but clearly they had never been to Dixon before. Not only is the rock just as, if not more, sharp - but the rock is extremely rough. Sessions there clearly wouldn’t last very long. My session was pretty much destroyed on the start hold to a V4 named Lucifer that I kept crimping onto two little shark teeth instead of holding it like a normal person. Was still a great trip, even if I hadn’t did something stupid and fell off on the final, easiest move f said problem. 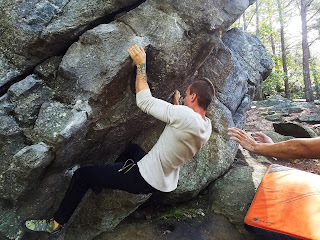 Derek hand-foot matching the start hold of Lucifer. Mike cruising through Classic Overhang. Keisei pulling through the final hard move of Atlas. This time I went outside with Andy, Matt, Hunter, and Isaac. Three of whom, had never climbed outside before. It was a great day, and I was convinced to disregard my fear of heights and hop on a few of the easy highballs out there. Was a great day. Keisei and Hiroshi drove in from Greensboro to go check out Crowders Mountain. We climbed a few sport routes. It was interesting watching Keisei climb our warm up and completely disregard the fact that it was a mixed route and just didn’t place any gear except at the bolts. Until he was being lowered. The last thing we all got on was Electra, a sick, exposed line that was pretty much a jug haul. Unfortunately, my endurance and mental game still needed some work. Great place, can’t wait to go back. Went to Moore’s again. Mike and I met up with Keisei, Hiroshi, and Jonathan. What I learned was I do not function well in the cold weather. Climbers always go on and on about how cold weather is perfect send temps. But for me it’s perfect “listen to my excuse to keep my jacket on” temps. For a few brief moments of warmth I hopped on Proper Modulation and Barb’s Bequest Stand to try to link some more moves. Barb’s Boulder might be one of the coolest looking boulders I have ever seen. Looking up at Barb's Bequest Stand. Hiroshi and Keisei drove back down from Greensboro to check out Dixon. 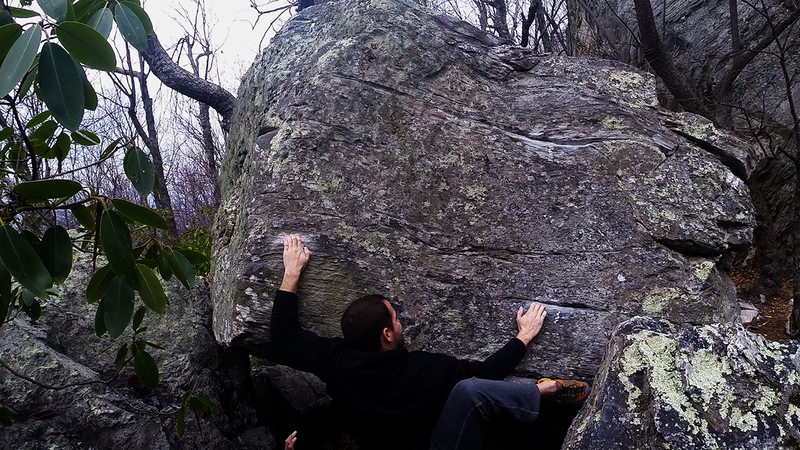 It devolved into a day of mainly goofing around amongst the boulders. Climbing by becoming Edward Cam Hands, and doing some Highball Trad Climbing. (Ropes are expressly prohibited at Dixon, but they didn’t say Keisei couldn’t climb some highballs, placing gear as he went.) Right as we got to Classic Arete, it started to drizzle on us, which was unfortunate because I really wanted to climb that line. 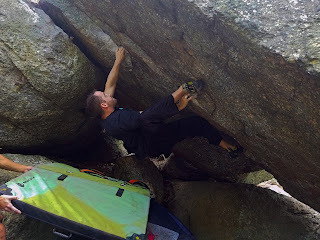 I still hadn’t topped a V4 since getting back into climbing, and I knew Classic Arete wasn’t too difficulty. It had one stopper move near the top, about 16-18 feet up. A move that 10’ lower would be nothing, but it was just high enough to make you stop and think about it. Luckily, all three of us sent it back to back before the rain really started to pour and we had to make our way to the gym. 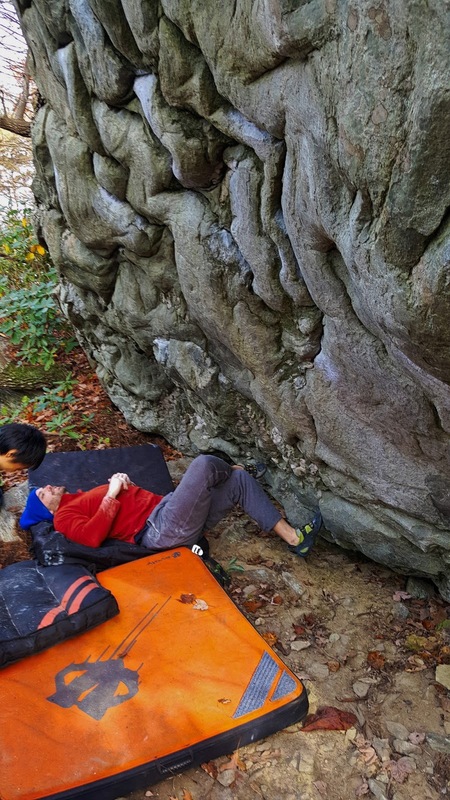 And people say Southeast boulderers don't spot. Keisei on the warm up, Papa Bear. Justin chillin' out on the Bears. Hiroshi sending his life-long project with style. Hiroshi on Born to Crimp, complaining about the slabby nature of the climb. Derek, secretly questioning why he wanted to climb Born to Crimp. Hit up Dixon with Justin on Black Friday. Steered clear of anything to hard since we only had one pad. But we hit up a few lines on the Incinerator Boulder on the way out. Third Degree might be one of the most interesting V3’s I have ever touched. Definitely worth the trip. Third Degree, one of the coolest V3's around! Took Andy and Alex to Moore’s Wall to show them around, and do some bouldering. Neither of them had been there before. I went there planning to hop on Stickman again. 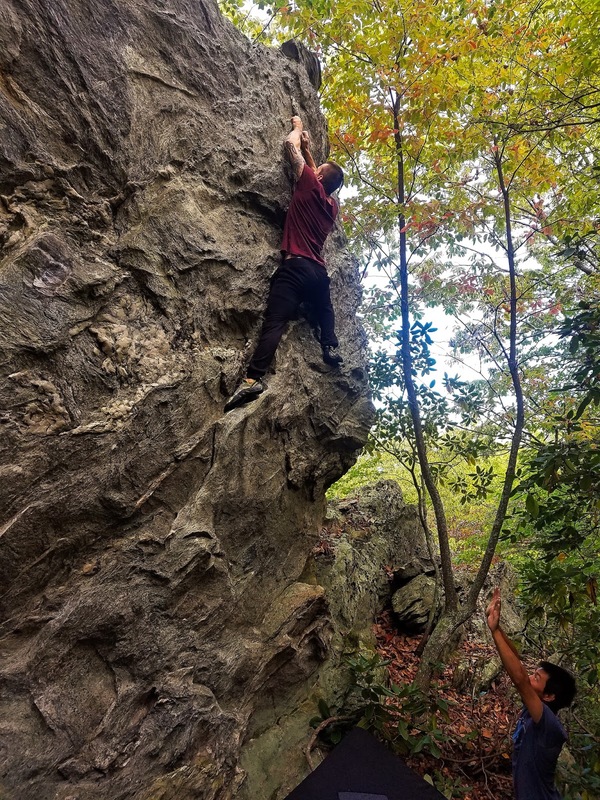 I was pretty hyped to try that problem again. While we were warming up, I learned that R2-V2 is apparently a climb very much in my style- because I always thought it was pretty soft, but learned that I might be in the minority. When we got to Stickman, I decided I would try slightly different beta, and I pulled onto the wall, planning to gym drop once I got past the actual V5 section. But everything went so smoothly and I had so much adrenaline pumping through me that I decided to keep going and topped out the 25-30ft line. I held onto that adrenaline, planning to use some of it later, and started pulling the group towards The Valley. Along the way Andy got his first V4, Garden Variety, and Alex topped Gym Rat Kevin, one of my favorite boulders. Once we were in The Valley I pulled onto Proper Modulation Stand and began to work the moves, again using slightly different beta than the last time. Unlike Stickman, it took a few tries, but eventually I had topped it out- only to marvel that Keisei had had the courage to top out the Sit Start version as his first V6, by himself, with only one crash pad. The top did not feel super secure! Proper Mod Stand second. Tacos third. Took a large group of people climbing at Pilot. Too many to name because this post is already WAY too long. We started in the Three Bears area so they could hop on some easier Top Ropes to get used to it… Okay so we started in that area because I wanted to hop straight onto Any Major Dude again. I toproped it once, figuring out the clipping stances, and remembering the once section before the crux, where there was a hidden crimp I kept forgetting about. For the second time I only fell once, so when I got to the ground I rested a bit, and decided to fire it up on lead. I was pretty nervous, but excited. After pulling through the crux I knew I had just sent the route. It felt great! The rest of the day we moved over to the Amphitheater and got everyone the chance to try out some easy lead outside. Most people took that chance. Made my way up to Dixon again this past weekend with Andy. We spent some time warming up before moving onto the sessions for the day. Andy fought through the terrible (hot and humid) conditions to top out Unicron. I remembered it being a unique climb from when I did it with Justin on Black Friday, but I got the feeling Andy liked it less than I did. Andy was then nice enough to stick around while I worked on Venom. 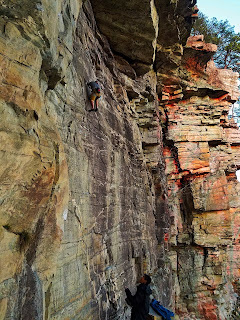 I had heard that it was a sharp, technical, and crimpy V5 that you really wanted to climb when it was cold and dry. With it in the 70’s and unusually muggy for February, I probably could have chosen a better problem to work. But I am glad I didn’t. 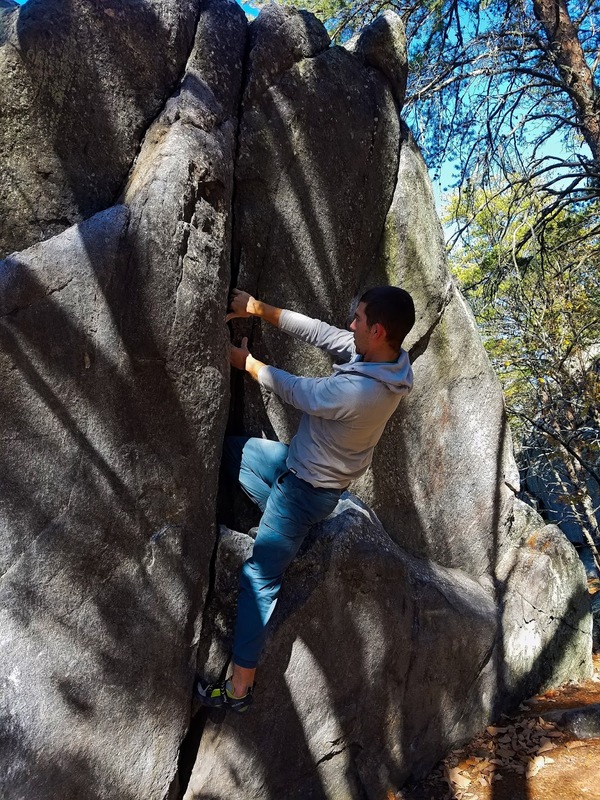 Once I remembered I was bouldering and not sport climbing, so I could use a lot of strength on the second move because, well you know, it's a boulder and not a 70 ft climb - I began getting to the second to last move pretty consistently. Unfortunately I struggled to get my balance just right and was finding it hard to get a solid right hand. Over a few attempts my left middle finger had begun looking like a spoon because the first crimp, easily one of the worst and sharpest I’ve had to really put all my weight on was making sure it was getting its fair share of skin tax from me. On my final, “last try” I managed to keep enough weight on left foot that I found a serviceable place to put my right hand. Not sure if I had the strength to bite down with my right hand and fix my balance I decided to throw for the next hold, which looked fairly slopey - not really intending for it to stick. Clearly I had forgotten how textured Dixon was, because once my left hand landed on the rock, it didn’t budge. 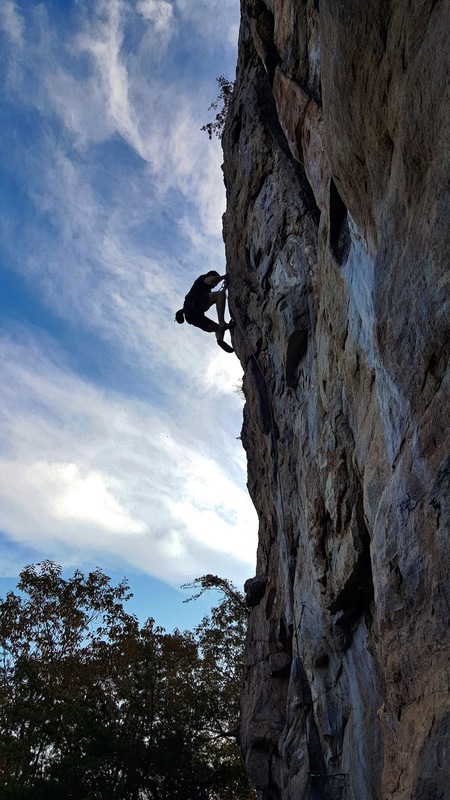 While Stickman and Proper Mod Stand were probably more my style of climbing, it was really nice to send Venom- and to feel all the work I had done on overhanging crimps had paid off. It was a great trip, that was capped off with Andy sending a slough of 3s on the hike out… while I sat by wishing the process of farming skin didn’t take so long. I have only been climbing once in the past month and I am definitely starting to miss it! I have gotten the chance to go kayaking a couple more times. I hit up the USNWC a couple of weeks back and then loaded the gear up to head out to National Camping School to get re-certified as a Program Director for summer camp. On the way, up, my car broke down and it ruined my plans of trying to find a river to paddle when everything had great flow. Alec on the first drop of Pinball. This past weekend I got the chance to paddle with my roommate, Alec, one last time before he made the move to Colorado. He’s actually been there for a few weeks now, but came back to NC to finish up his degree with a short summer course. We hit up the Upper Green with our friend Brandon, who I’ve never paddled with before. The day was great with clean runs down the Upper Green from all of us. After stuffing our faces with Saluda Stuffers, we headed to Fishtop and paddled across the small pond at the put in to Pulliam Creek Trail to make our way into the Narrows, towards Hammer Factor. It was the first time any of us had hiked on this trail, but I found it to be easier overall than the other trail towards Hammer Factor. I walked further down the trail and added a couple of rapids of the Narrows I had never paddled before, starting a little above what I believe is Blackwater Falls. It’s clearly been a long time since I last posted. Well, at least I’m not as bad as Evan! The past two months I have been active- but I’ll get to that in another post. Right now, I want to talk about my Personal First Descent of Big Laurel Creek. The story begins a couple of weeks ago, when my roommate, Alec, and I went and paddled the Deep River. It was a nice warm up for the year, but definitely left a hunger in our stomachs. We painfully watched the river levels over the next week-and-a-half. Everything had water, but we were too busy with work and school to go paddle. Finally, the opportunity arose where Jamie and I would be in the mountains near the rivers; we had found our window. To make things fun, Alec, Jamie, and I invited our friends Patrick and David to join us. Alec and I were hoping to get everyone out on a river that would be a step harder than what they had done in the past, but still be fun for everyone. We had been planning on the French Broad, section 9. A few days of rain before the trip brought that idea crashing down with a flooded river that we weren’t committed to taking three new paddlers on. We then turned our eyes to the Green River. Jamie and Patrick both have been down the Upper Green a few times now and it seemed like they were going to add a notch to their belt. Luck was on our side because water was spilling over the dam to Lake Summit. If the lake level reached at least 100.6% we would be able to paddle the Dries. Yesterday morning when I woke up, I called and checked the lake level: 100.63% Perfect! The Dries had enough water to get us down, but not so much water that Jamie, Patrick, and David couldn’t join us. Not wanting to get stuck on the river after the water release shut off I made sure to find out about the scheduled release times. “No Scheduled Release.” What I didn't know then, was that they were running the dam all day long. No shutoff time! I made the decision that we would go to Big Laurel Creek. It was a river I had been wanting to paddle for quite some time, but hadn’t been eyeing because I thought it might be a little too much for some of the others to handle. They proved me wrong. Jamie, Patrick, and David all did great! David managed to get his first two rolls on a real river- and managed to stay in his boat the whole time. He even got his first Class IV that day. And even though Patrick and Jamie both swam some, I was very proud of how well they did. Their resilience was very inspiring. Big Laurel is probably one of the most beautiful rivers I’ve paddled, and just what we were looking for. It started out at a great pace. A slew of Class II's to warm up on before picking up the pace. Plus, getting to run a creek style river that dumps into a Big Water river was an interesting experience for everyone. 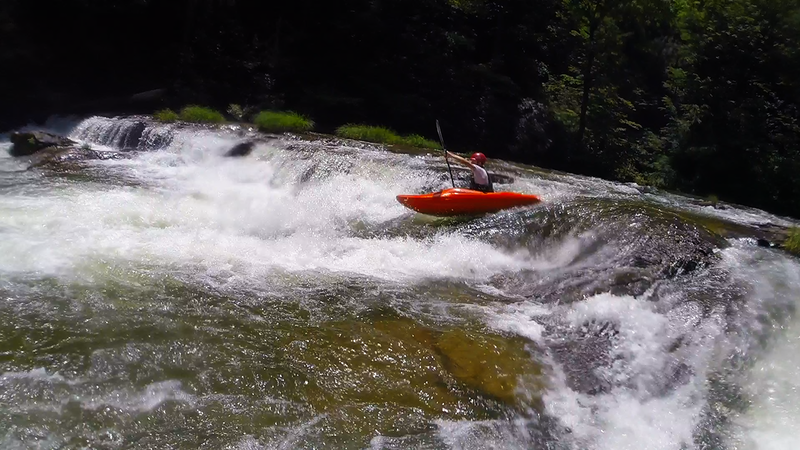 Switching from the steep rapids on Big Laurel to the last couple miles of French Broad, section 9 was a hoot! 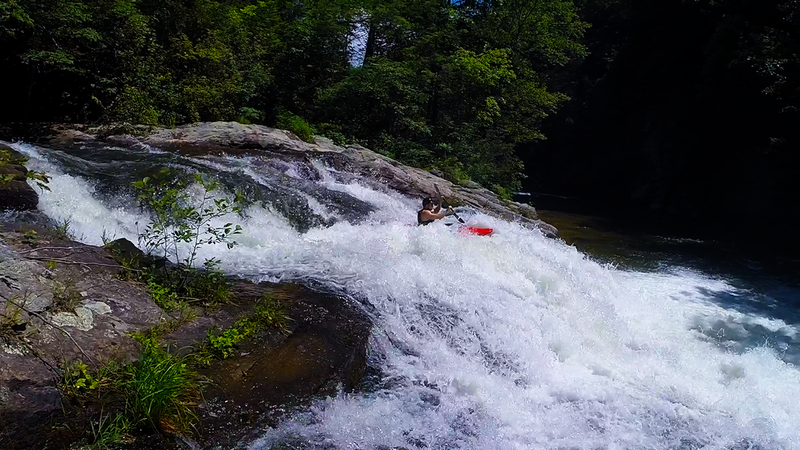 FB9 was pumping at around 5,500cfs which made Kayakers Ledge (normally a Class III) into a super beefy double drop with sticky holes on both. Frank Bell’s was a solid Class IV and super fun! Keeping Busy - Having Fun! It has actually been a pretty crazy month! It’s been awhile since I have posted so I figured I would post something short just as an update. I’ve felt like I’ve stayed active just because of the way my schedule has worked out. A few weeks ago UNCG hosted their 19th Annual Spartan Summit. Instead of competing this year, I helped set for the Intermediate division. It was a blast to work with everyone and to set a large group of routes that all differentiated themselves through various styles. I also got the chance to go outdoors a few times here recently. 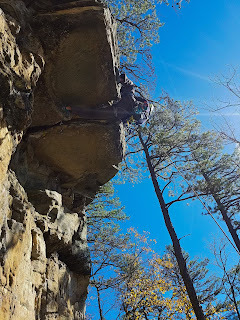 I got the chance to head out to Pilot Mountain with some of the climbing club. It was a great day. 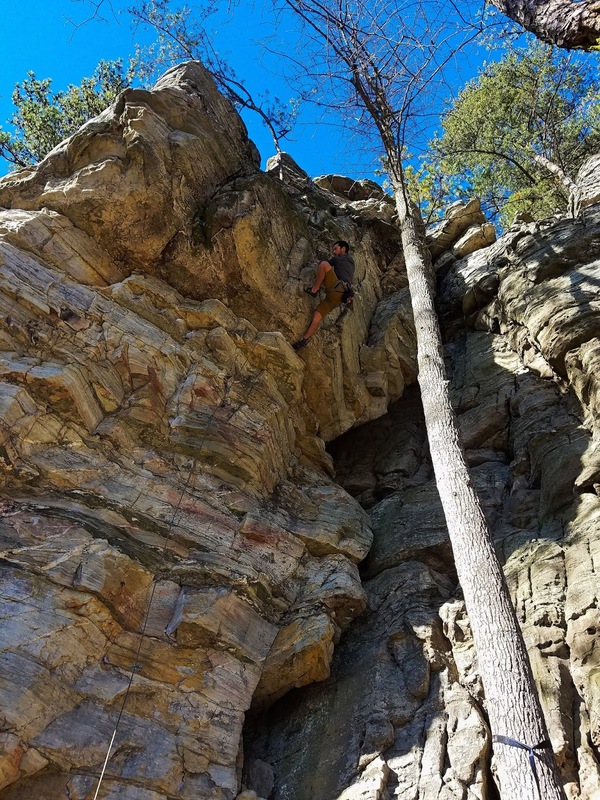 I do wish that I had gotten the chance to climb more, but I did manage to get on a 5.9 that was new to me and to finally send a 5.10 that I tried back in September. It was a great experience where I got to really feel how much I’ve improved over the past five months. 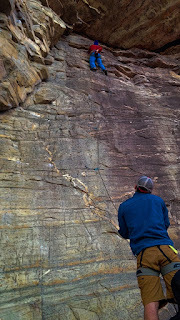 It was also a blast getting to teach people how to lead climb and to get them on their first lead routes. It astounds me that less than a year ago I was learning how to lead myself. This past Monday I got the chance to hit up Moore’s Wall for some outdoor bouldering. I would be lying if I said I was overly happy with how I climbed. I flashed a smattering of V1s and V2s before hitting a brick wall in the V3 known as “V3PO”. 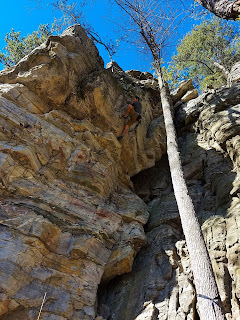 Most of the problems were more overhung that I am used to and am excited to head back out there and hope that being more comfortable with the style that I will climb better.